For avid readers, tablets provide the best way to carry an unending supply of books, especially if you have a subscription ebook service, like Amazon's Kindle Unlimited ($9.99/mo.) and Scribd ($8.99/mo.). 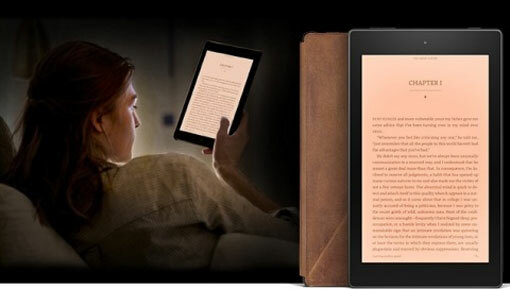 Now, Amazon has a money-saving offer for readers, its new Fire HD 8 Reader’s Edition. Normally, the 8 GB Fire HD 8 is $149.99. If you wanted to add Kindle Unlimited to read over a million e-books and thousands of audiobooks, you’re looking at $119.88 for a full year subscription. And if you want to protect your Fire with a limited edition brown leather case, that’s an additional $79.99. The Fire HD 8 Reader’s Edition brings that $349.86 total down $100 to $249.99. Not bad. The HD 8 has an eight-inch display with over a million pixels, along with a quad-core processor, front- and rear-facing cameras and an eight-hour battery life. Clearly, the eights have it with this tablet. While there are some new OS updates coming to all the Fire tablets with OS5 Bellini, one of the coolest is Blue Shade. If you read on your cell phone right before bed, you probably have a tough time falling asleep, for a scientific reason: blue light like that of your mobile devices decrease melatonin production. Melatonin is a hormone that helps you fall asleep, so having less of it is a problem. Blue Shade’s filters minimize blue light and extend your Fire’s battery life up to 25 percent to help you rest easier. The only real deficit of the Reader’s Edition is its lack of customization compared to the standard Fire HD 8. While the Fire HD 8 comes standard with 8 or 16 GB of storage, the Reader's Edition is 8 GB (although you can add up to 128 GB of storage space with a microSD card). And the Reader’s Edition only comes in black, while the standard version comes in black, magenta, blue and tangerine. If you were hoping to match your Fire to your favorite color, you might just be out of luck. All in all, the Kindle Fire HD 8 Reader’s Edition gives you the power of the Fire OS, but with cheaper options to make your reading easier. It’s available for pre-order now.